Welcome to Week #3 of the OCG 2019.01 format. This report will cover 35 top-performing decks from 5 tournaments that were held in Japan and China during 19 – 22 January 2019. 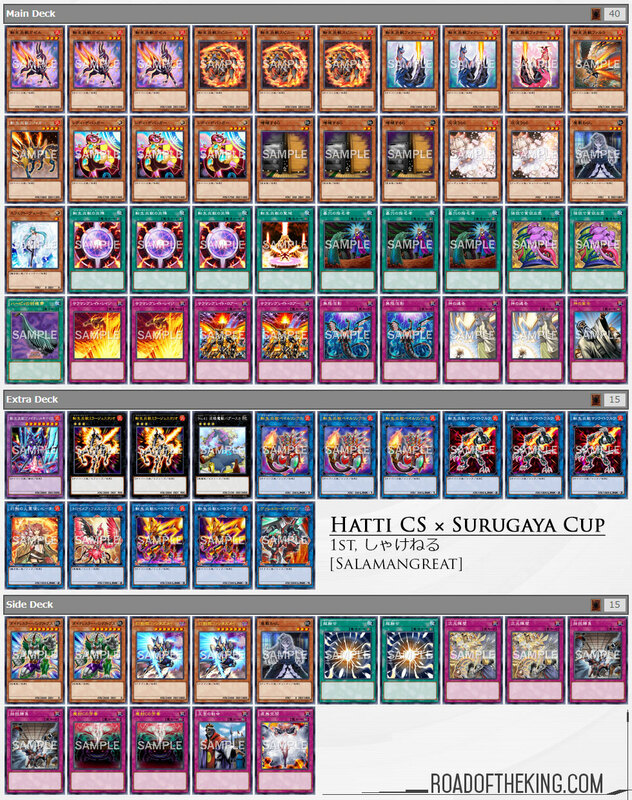 Kinnikuso (きんにくそ) went 7-2 and finished 2nd in “Hatti CS × Surugaya Cup in Surugaya Takatsuki Trading Card House” which had 64 participants. The overall pace of the metagame has slowed down and more decks are going taking a more control approach by running more Solemn Traps in the deck. Kinnikuso ran 2 copies of Solemn Judgment in the Main Deck. One of the more common ways that Sky Striker loses control of the game is having a timely Harpie’s Feather Duster sweeping their Spells/Traps and nulling the advantage from Sky Striker Mecha Modules – Multirole. As Solemn Judgment could negate Harpie’s Feather Duster and Twin Twisters, it is the preferred choice for Sky Striker over Solemn Strike and Solemn Warning. After a poor debut weekend, Orcust is starting show some results. There is yet to be an optimised build for Orcust as players are still currently experimenting with different combos. The starting point of the combo is to Link Summon Knightmare Mermaid and use its effect to Special Summon Orcust Knightmare. That would lead to The Phantom Knights of Rusty Bardiche and following up with The Phantom Knights’ Rank-Up-Magic Launch on Sheorcust Dingirsu to bring out True King of All Calamities. 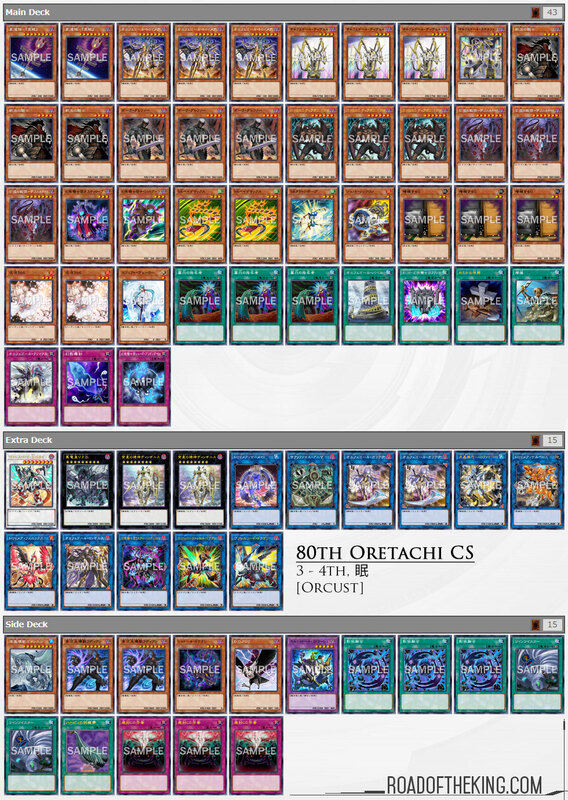 Nemuru (眠) went 5-1 and finished 3 – 4th in “80th Oretachi Trading Card Division CS” which had 38 participants. He is running the DARK Warrior engine. Armageddon Knight and Dark Grepher are used for sending Destiny HERO – Malicious to the graveyard, whose effect would then Special Summon another Malicious. Then together they are used to Link Summon either Knightmare Cerberus or Knightmare Phoenix, which can be used to Link Summon Knightmare Mermaid, thus starting up the combo. The advantage of the DARK Warrior engine is having the Destrudo the Lost Dragon’s Frisson synergy, a Tuner Monster that enables Crystron Needlefiber and Borreload Savage Dragon. 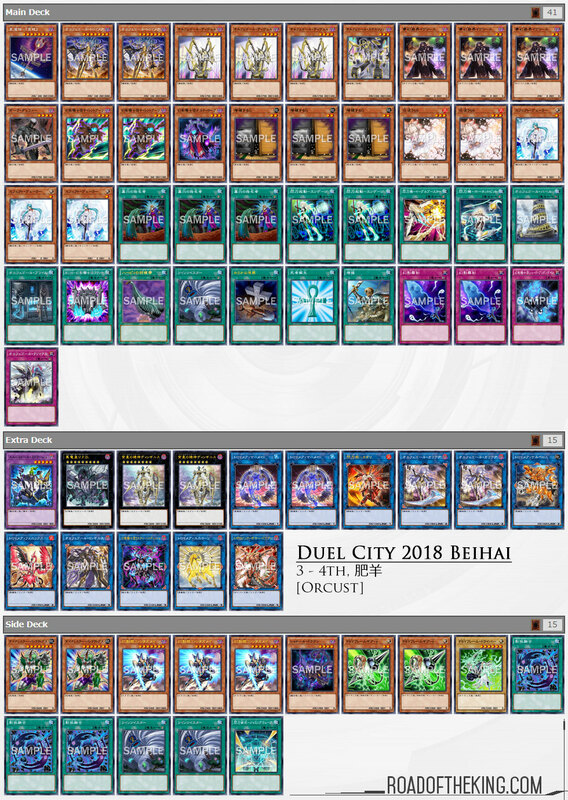 Fat Sheep (肥羊) went 5-1-2 and finished 3 – 4th in “Duel City 2018 Beihai” which had 45 participants. He is running the Sky Striker engine. Sky Striker Mecha – Hornet Drones will create a “Sky Striker Ace Token” that can be used to Link Summon Sky Striker Ace – Kagari, taking back Hornet Drones. Hornet Drones is then played again to create another Token and together with Kagari they are used to Link Summon Knightmare Cerberus or Knightmare Phoenix, and then going into Knightmare Mermaid. The other alternative opening is using Knightmare Corruptor Iblee to directly Link Summon Knightmare Mermaid. However, if both Hornet Drones and Iblee are in the opening hand, then the Hornet Drones combo can be executed first to bring out Knightmare Mermaid. After which Normal Summon Iblee and use its effect to Special Summon Cerberus or Phoenix from the graveyard, allowing for an extended play. 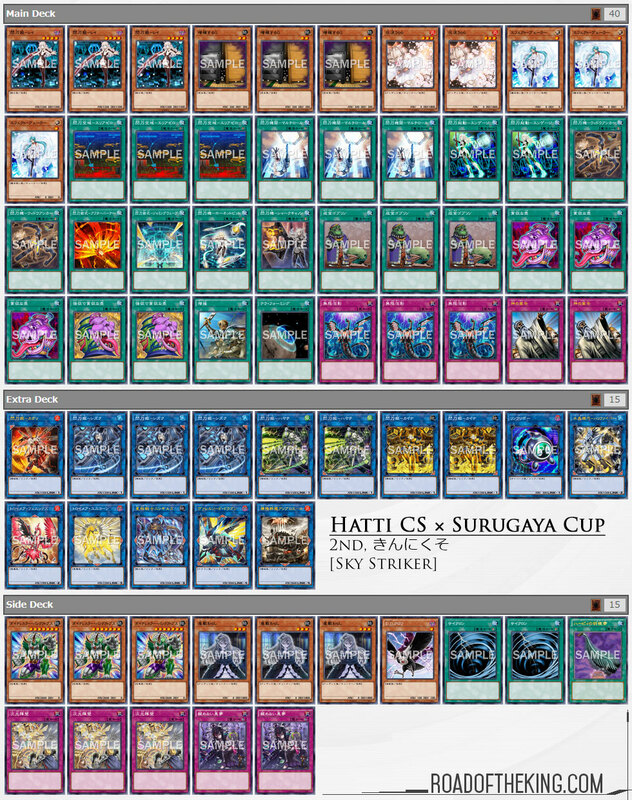 Shakeneru (しゃけねる) went 8-0 (excluding 1 bye) and finished 1st in “Hatti CS × Surugaya Cup in Surugaya Takatsuki Trading Card House” which had 64 participants. He was featured in last week’s report and went on to achieve another victory this week. He has tuned his Side Deck to improve his match-up against Thunder Dragon, cutting out 2 D.D. Crow and 1 Starving Venom Fusion Dragon for 1 Ghost Belle & Haunted Mansion and 2 Dimensional Barrier. 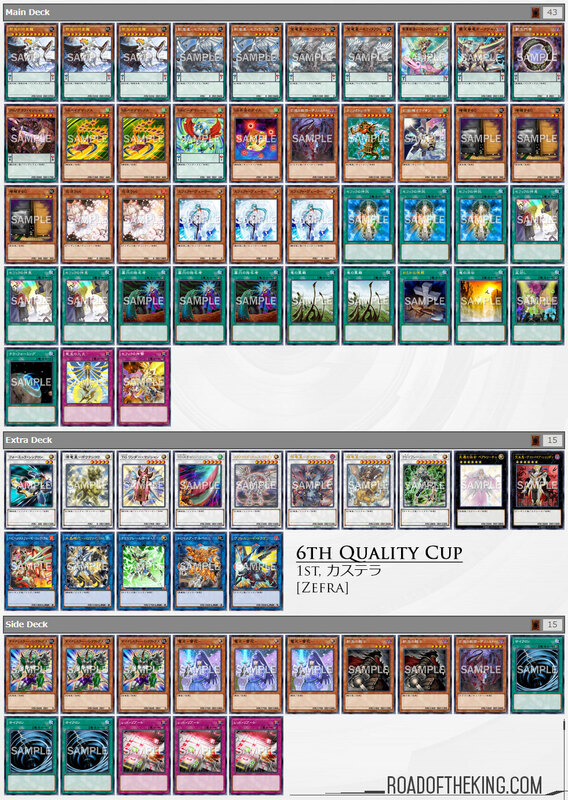 Castella (カステラ) went 5-0-2 and finished 1st in “6th Quality Cup” (Team 2v2) which had 26 teams (52 participants). He ran a Speedroid engine consisting of 2 Speedroid Terrortop, 1 Speedroid Marble Machine and 1 Speedroid Red-Eyed Dice. Speedroid Marble Machine is a Pendulum Monster with Pendulum Scale 1. This low Pendulum Scale complements with Zefraath since Zefraath‘s Pendulum Effect is commonly activated by sending Zefraniu, Secret of the Yang Zing and changing its Pendulum Scale to 7. When going first, Special Summon Speedroid Terrortop and then search and Normal Summon Speedroid Red-Eyed Dice to go into Crystron Needlefiber. When going second, Special Summon Speedroid Terrortop and then search and Normal Summon Speedroid Red-Eyed Dice to change Terrortop’s Level to 6. Both of them are then used to Synchro Summon Yazi, Evil of the Yang Zing. Activate Yazi ② effect to destroy an opponent’s card and itself, triggering its ③ effect and Special Summon Mare Mare from the deck, opening up for an OTK. The Speedroid engine complements well with Zefra, providing the flexibility to fetch for a low Pendulum Scale or for developing the board. 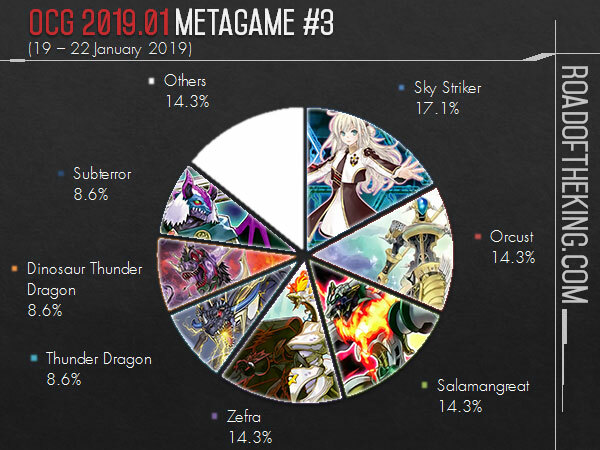 Sky Striker, Orcust, Salamangreat and Zefra are sharing the top spot with an almost equal split. Thunder Dragon, Dinosaur Thunder Dragon and Subterror are trailing not too far behind. 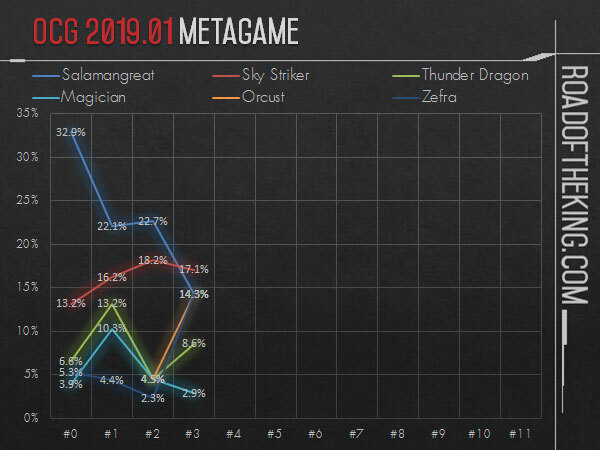 The metagame has yet to settle, especially with Orcust joining in the competitive scene, and should expect to see some changes over the next few weeks. Do you have the subterror list? May I see the zefra dino lists? As for Zefra part, is there any content after the last sentence “The Speedroid engine” ? Oops. My words was eaten up while doing the formatting. Fixed it, thanks! I was wondering about the DARK Synchro list.